By Jennifer Steele Osteoporosis is the term used to describe porous bones. It is a chronic medical condition that affects the bones of the body. The condition is such that the bones of the body become brittle as their micro-structure is altered. Our bones are living tissue and so from the moment we are born till the moment we die our bodies are replacing parts of our bones, developing the bones density and strength. When we are in our 20’s our bones are at their strongest. This time is known as our peak bone mass age. Within our bones we have different cells. There are certain cells that break down old bone tissue known as the Osteoclast cells. This process is known as resorption. 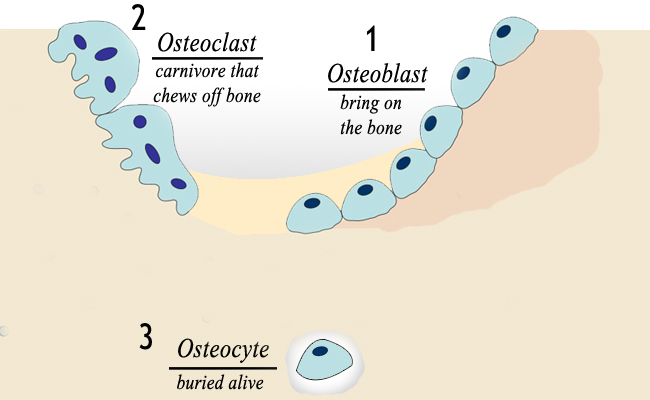 Other cells known as the Osteoblasts then fill the spaces made by the Osteoclasts with new bone. This is known as the remodeling process. These processes run continuously in our bones during all stages of our lives. Interestingly enough, it takes approximately 10 years for our entire skeleton to be replaced. Once we reach the age of 35 our Osteoblast cells slow down meaning the remodeling process becomes slower. For individuals with Osteoporosis the bone loss outpaces the bone growth and so the bones become brittle and porous. In simple terms the body either loses to much bone, doesn’t make enough bone or both. When we view the micro-structure of our bones under a microscope it looks like a honeycomb. 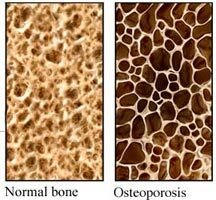 However, when the individual has osteoporosis the holes and spaces in the honeycomb become much greater and so the bones density is far less. This makes the bone brittle and weak and in severe cases even minor bumps or falls can cause the affected bones to break. The most common areas affected are the spine, hips and wrists. However, all areas of the body can be affected and can break if a force is applied. Osteoporosis is an extremely common disease and it is estimated that an osteoporotic fracture occurs once every three seconds. The disease affects one in three women and one in five men over the age of 50 years old. To diagnose Osteoporosis a Bone Mineral Density (BMD) test is done. Unlike an X ray which can only identify if there is a fracture in a bone, a BMD test can measure the density of the bones. Based on the result of this test an individual will either be classified as normal, Osteopenic (low bone density) or Osteoporotic (extremely low bone density). Osteoporosis is a preventable disease and can be treated. Medication can be used to help treat osteoporosis where the primary aim is to slow down the bone loss and speed up the bone remodeling. There are usually two groups of medication and each are aimed at one of these aspects. One of the most important aspects of treatment for individuals with Osteoporosis is to prevent falls. Therefore, this is the first area that exercise can be brought in to help. Exercises to improve balance, stability and reaction time should be included at least 2-3 times a week to help prevent the individual falling. Exercise can also be used to help prevent Osteoporosis. Doing weight bearing and muscle strengthening exercises will help maintain bone strength and growth. Weight bearing exercises can be both low and high impact and so it is important to chose suitable exercises for each individual. Muscle strengthening exercises are also important as these also help maintain bone strength as well as help keep the individual independent, mobile and functional. For more information on how exercise can help treat and prevent Osteoporosis don’t hesitate to contact us. This entry was posted on Tuesday, November 13th, 2018 at 12:54 pm and is filed under In Session. You can follow any responses to this entry through the RSS 2.0 feed. Both comments and pings are currently closed.